First, what is a heading? Great! Now how can we apply this to our theme? In today’s post, I’m going to focus one aspect in making our WordPress theme accessible – and that aspect is headings. After reviewing what headings are, and what they’re for, we’ll go into our theme files and make any changes necessary related to headings. It should only take a few minutes and although we’re only focusing on headings in this post, it’ll bring us one step closer to making our theme accessible. Let’s get started. As an FYI, I’ll be using TwentyThirteen for most of my references, but the theme I’m using on this blog is Hexa. A heading in html are the “title” tags, I like to call them, ranging from the highest one (h1) to the lowest (h6). They’re used to organize content for SEO as well structuring your site content in a way that makes sense to screen readers or other technology to assist those with disabilities. You can get an idea of how this works if you view your WordPress theme right now, and use the tab key to navigate instead of your mouse when the page loads. If you try it on WordPress’ TwentyThirteen Theme Demo, you’ll notice that after the tabbing goes past the logo, navigation, and search bar, that it takes the user to the title of each post, any links within content, taxonomy and so on before it goes to the next post and does the same thing. 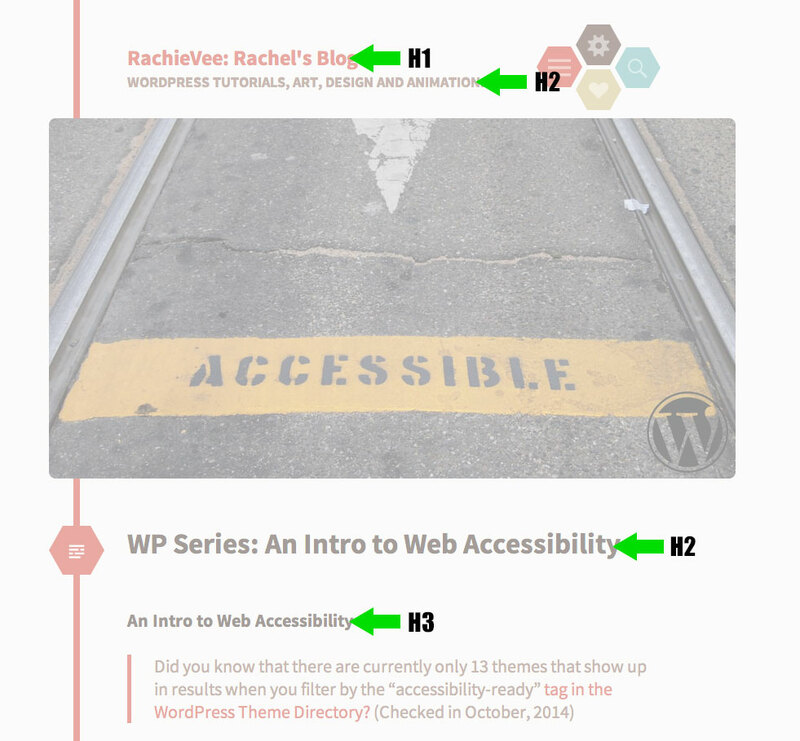 TwentyThirteen is marked with the theme accessibility tag. If you tried this on a theme that isn’t structured so well html wise – well perhaps the tabbing won’t flow in a way that makes sense. You may not even clearly see where your tabbing on the page – which is a css focus issue that we’ll talk about in a future post. Take a look at the TwentyThirteen screenshot below to get an idea of how headings should be ordered. 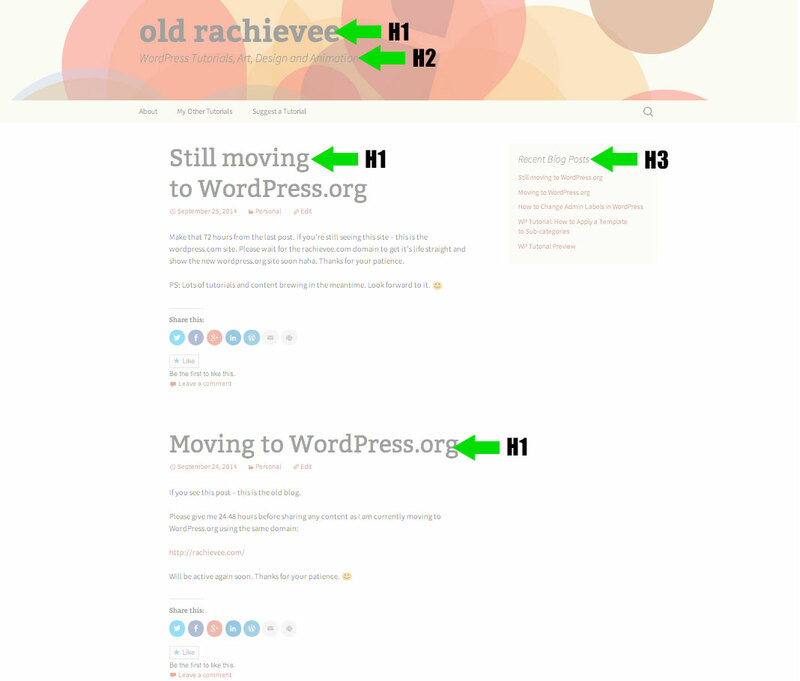 Ideally, there should only be one H1 tag on a page, usually reserved for the logo/site heading although that’s a bit of a debate so I’ll leave that up to you. What follows after an H1 are the secondary sub-headings, H2, and then the third sub-headings, H3, and so on. The H1 is reserved for the most important titles whereas H2 is for the second important. The widgets titles were determined to be the least important and are assigned H3. I normally remove the site description as I almost never display it beneath my site title/logo. This is just my personal preference. For my current theme, Hexa, I’ll remove it when I replace my header with a logo (at some point, ah procrastination, my mortal enemy). For now though, guess I’ll leave it in – moving on! There may be other templates depending on your theme, but the goal here is to ensure that any blog post titles or page titles are wrapped in H2 tags. You might also want to check your functions.php and look for where your sidebars are being registered with register_sidebar(). Confirm that these are an appropriate heading. In Hexa, they were originally H1s, which is understandable considering it’s on the top of the site above my site title, but they’re not as important as the site title. So to stick to my original goal of one H1 and de-prioritize them heading-wise, I changed the widget titles to be H3s in the before_title and after_title parameters. Here’s what that change looks like in my functions.php in Hexa ( using a child theme of course ). My current Hexa theme is now arranged similarly to Twenty Thirteen, except I reserved the H1 for the logo/site title only, and used the H2s for secondary important titles. I’ve reserved my H3s for widgets and in content titles. In my text editor, since I know my post title is using an H2, the next logical title would be H3. I don’t normally use anymore headings than that, but if I ever do, the next logical heading tag I’d use after h3 would be an H4. Meaning that H4 would be a sub-heading within the H3 block of content. If that’s not the case, here’s where you’ll have to put a bit of effort and fix them. Now, if your site has hundreds of posts/pages, then it’s understandable if this is a step that you want to skip. However, it’s in your best benefit to fix them eventually so that your site is accessible to everyone. You can work on a few posts a day or grab a buddy to help out. Or maybe if it’s just that much content, just making sure your headings are in the right order from this point is fine – just keep in mind that your older content may prove difficult for those audiences that benefit from proper accessibility structure. Hopefully we’ve only spent a few minutes reviewing and going over headings ( unless you’re one of those guys with the billion posts to edit – Ganbatte! ). 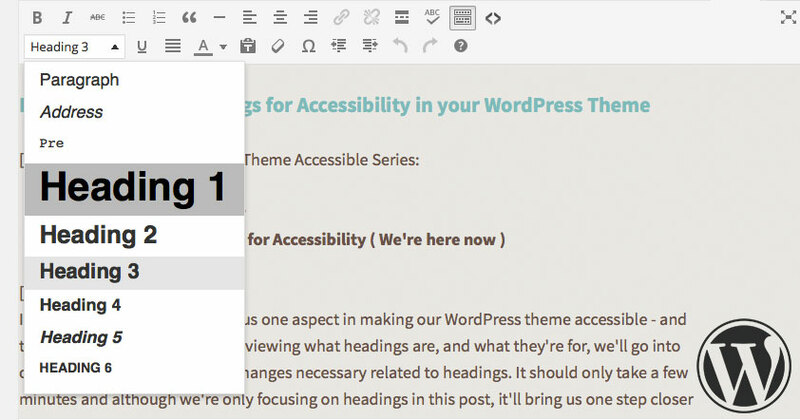 There’s a lot more to making our WordPress theme accessible, but we’re already one step closer now that we’ve gone over what headings are, what they’re for, and edited our template files. 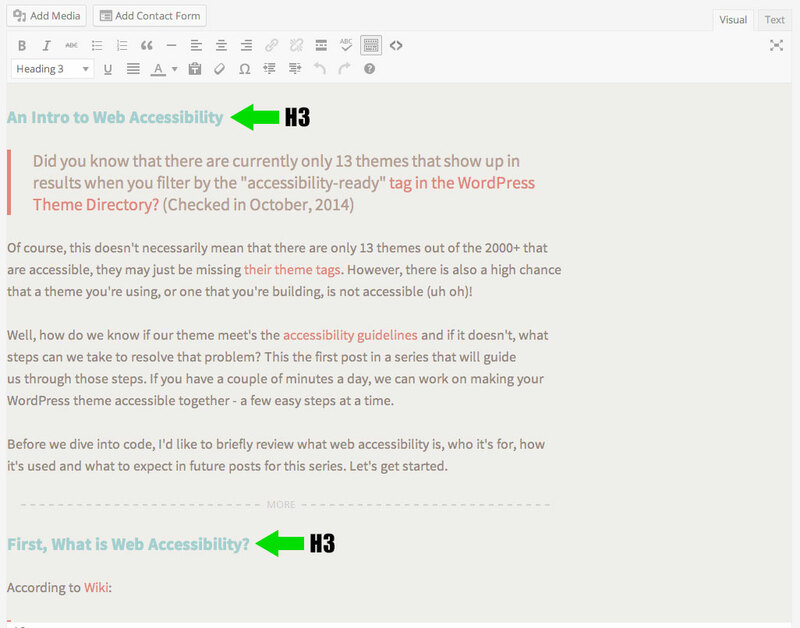 In the next installment, we’ll go over a new aspect to bring our theme closer to meeting accessibility guidelines.